My high school graduating class voted me Wittiest. It’s hardly something I boast about. Best Looking? Most Likely to Succeed? Nope. I got Wittiest. Does any other school even have such an award? In my school, it went to the guy who made people laugh but wasn’t obnoxious enough to qualify as Class Clown (That distinction went to John Gerrold, who, at one reunion, emerged from the restroom onto the dance floor with twelve feet of toilet paper trailing from his pants. Get the idea?) I tended to be funny without getting in trouble for it. 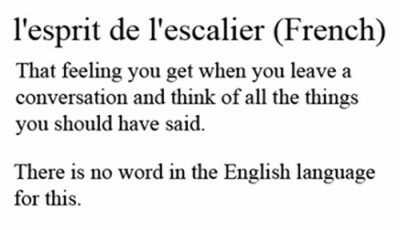 Esprit de l’escalier can be literally translated “staircase wit.” It’s a French idiom that has no parallel in English. But it should. 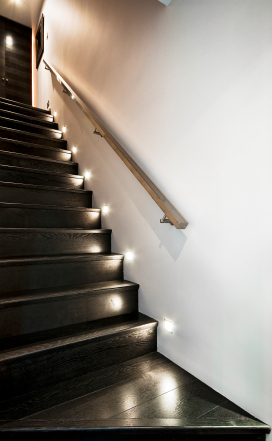 It summons the vision of someone leaving the house at the end of the evening — descending the stairs — when the perfect witty remark belatedly dawns upon him. But since there’s no English word for it, we can just borrow the French, oui? Like this post? Subscribe to the WriteAtHome Blog and we’ll send you one weekly email will links to all our interesting, instructive, and entertaining posts! I really enjoyed this post, by the way! Your blog continues to be awesome!